If you were to remove all the organelles from a cell, would the plasma membrane and the cytoplasm be the only components left? No. Within the cytoplasm, there would still be ions and organic molecules, plus a network of protein fibers known as the cytoskeleton. Both prokaryotes and eukaryotes have a cytoskeleton. Both types of organisms use their cytoskeleton for cell division, protection, and shape determination. In addition, in eukaryotes the cytoskeleton also functions to secure certain organelles in specific positions, and to allow cytoplasm and vesicles to move within the cell. It also enables unicellular organisms to move independently. 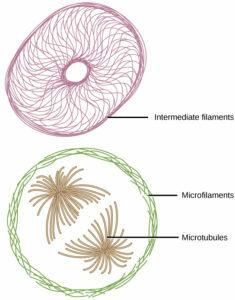 There are three types of fibers within the cytoskeleton: microfilaments, also known as actin filaments, intermediate filaments, and microtubules (Figure 9). Figure 9 Microfilaments, intermediate filaments, and microtubules compose a cell’s cytoskeleton.